Whether you are considering a total joint replacement, or are just beginning to explore available treatments, this website is for you. It will help you understand the causes of joint pain and treatment options. Most importantly, it will give you hope that you will be able to do more of the things you enjoy — with far less pain. Once you’re through reading this website, be sure to ask your doctor any questions you may have. Gaining as much knowledge as possible will help you choose the best course of treatment to help relieve your joint pain — and get you back into the swing of things. A joint is formed by the ends of 2 or more bones that are connected by thick bands of tissue called ligaments. For example, the knee joint is formed by the lower leg bone, called the tibia or shin bone, and the thigh bone, called the femur. 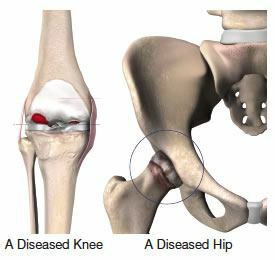 The hip joint is a ball-and-socket joint, formed by the ball, or femoral head, at the upper end of the thigh bone, and the rounded socket, or acetabulum, in the pelvis. 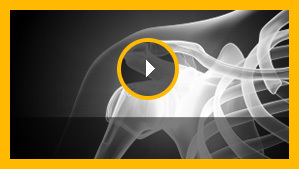 The ends of the bone in a joint are covered with a smooth, soft material called cartilage. Normal cartilage allows nearly frictionless movement. The rest of the surfaces of the joint are covered by a thin, smooth tissue lining called the synovium. The synovium produces fluid that acts as a lubricant to reduce friction and wear in the joint. It is sometimes called degenerative arthritis because it is a “wearing out” condition involving the breakdown of cartilage in the joints. When cartilage wears away, the bones rub against each other, causing pain and stiffness. OA usually occurs in people aged 50 years and older, and frequently in individuals with a family history of osteoarthritis. It produces chemical changes in the synovium that cause it to become thickened and inflamed. In turn, the synovial fluid destroys cartilage. The end result is cartilage loss, pain, and stiffness. RA affects women about 3 times more often than men1, and may affect other organs of the body. It may develop after an injury to the joint in which the bone and cartilage do not heal properly. The joint is no longer smooth and these irregularities lead to more wear on the joint surfaces. It can result when bone is deprived of its normal blood supply. Without proper nutrition from the blood, the bone’s structure weakens and may collapse and damage the cartilage. The condition often occurs after long-term treatment with cortisone or after organ transplantation. The medical management of arthritis and joint degeneration may be handled by a family doctor, an internist, or a rheumatologist. However, when medical management is not effective, an orthopaedic surgeon should be consulted to determine if surgery is an option. In some cases, the orthopaedic surgeon may be the first physician to see a patient and make the diagnosis of arthritis. A medical history is taken to assist the orthopaedic surgeon in evaluating your overall health and the possible causes of your joint pain. If you are experiencing pain in your hip joint, your back may be examined because hip pain may actually be the result of problems in the lower spine. Occasionally, additional tests may be needed to confirm the diagnosis. Laboratory testing of your blood, urine, or joint fluid can be helpful in identifying specific types of arthritis and in ruling out certain diseases. Specialized X-rays of the back can help confirm that hip pain isn’t being caused by a back problem. Magnetic Resonance Imaging (MRI) or a bone scan may be needed to determine the condition of the bone and soft tissues of the affected joint. Where and when do I have pain? How long have I had this pain? Do I have any redness or swelling around my joints? What daily tasks are hard to do now? Did I ever hurt the joint or overuse it? Does anyone in my family have similar problems? Many different medications are used to treat the pain and stiffness of arthritis. One of the most commonly prescribed types of drugs are the non-steroidal anti-inflammatory agents, or NSAIDs, which can be taken long-term to reduce both the pain and swelling caused by arthritis. Another type of medication prescribed to reduce severe pain and swelling are corticosteroids. Corticosteroid injections offer quick, effective pain relief. However, they can be used only a few times a year because they weaken bone and cartilage. Also, corticosteroids can cause other potentially serious side effects; their use must be monitored by a physician. For patients whose knee joint pain does not improve with medication or physical therapy, “joint grease” injections may provide temporary relief. The knee is injected with a joint fluid supplement that acts as a lubricant for the damaged joint. Joint injection schedules and duration of relief vary according to the treatment chosen and the individual patient. However, these injections do not cure the diseased knee, and joint replacement may be needed as the joint worsens with time. What is Total Joint Replacement? Total joint replacement is a surgical procedure in which certain parts of an arthritic or damaged joint, such as a hip or knee joint, are removed and replaced with a plastic or metal device called a prosthesis. The prosthesis is designed to enable the artificial joint to move just like a normal, healthy joint. 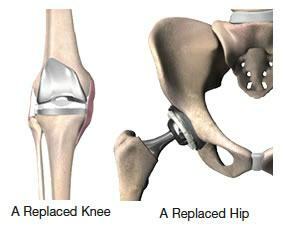 Hip replacement involves replacing the femur (head of the thigh bone) and the acetabulum (hip socket). Typically, the artificial ball with its stem is made of a strong metal, and the artificial socket is made of polyethylene (a durable plastic). In total knee replacement, the end of the femur (thigh bone) and the top of the tibia (shin bone) are resurfaced. 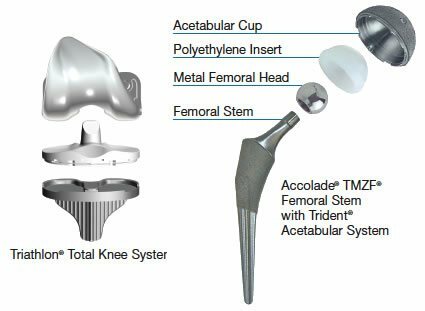 The artificial knee implant is also composed of metal and polyethylene. The prosthesis is secured into place with bone cement or is covered with an advanced material that allows bone tissue to grow into it. Total joint replacements of the hip and knee have been performed since the 1960s. Today, these procedures have been found to result in significant restoration of function and reduction of pain in 90% to 95% of patients.1 While the expected life of conventional joint replacements is difficult to estimate, it is not unlimited. Today’s patients can look forward to potentially benefiting from new advances that may increase the lifetime of hip and knee prostheses. 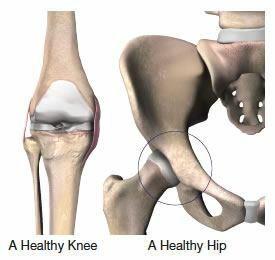 Approximately one million hip and knee replacements are performed each year in the U.S.1 As successful as most of these procedures are, over the years, the artificial joints can become loose and unstable, requiring a revision (repeat) surgery. These issues – together with the fact that increasing numbers of younger and more active patients are receiving total joint replacements, and older patients are living longer – have challenged the orthopaedic industry to try to extend the life of total joint replacements. Recent improvements in surgical techniques and instrumentation can help to further the success of your treatment. The availability of advanced materials, such as titaniumand ceramic prostheses and new plastic joint liners, provides orthopaedic surgeons with options that may help to increase the longevity of the prosthesis. Infection may occur in the wound or within the area around the new joint. It can occur in the hospital, after the patient returns home, or years later. Following surgery, joint replacement patients receive antibiotics to help prevent infection. For the rest of their lives, they may also need to take antibiotics before undergoing even minor medical procedures to reduce the chance of infection spreading to the artificial joint. Pneumonia is always a risk following major surgery. To help keep the lungs clear of congestion, patients are assigned a series of deep breathing exercises. It may come as a surprise to you that total joint replacement patients are encouraged to get up and start moving around as soon as possible after surgery — as early as the day of surgery. When you are medically stable, the physical therapist will recommend certain exercises for the affected joint. Physical therapy is a key part of recovery. To ease the discomfort the activity will initially cause, pain medication is recommended prior to therapy. In addition, the physical therapist will discuss plans for rehabilitation following hospital discharge. Depending on your limitations, an occupational therapist may provide instruction on how to use certain devices that assist in performing daily activities, such as putting on socks, reaching for household items, and bathing. A case manager will discuss plans for your return home and will ensure that you have all the necessary help to support a successful recovery. The vast majority of individuals who have joint replacement surgery experience a dramatic reduction in joint pain and a significant improvement in their ability to participate in the activities of daily living. However, joint replacement surgery will not allow you to do more than you could before joint problems developed. Your doctor will recommend the most appropriate level of activity following joint replacement surgery. In the weeks following total joint replacement, certain limitations are placed on every patient’s activities. Using a cane or walker may be necessary for several weeks. Kneeling, bending, and jumping will likely be forbidden for the first month. It may be 6 weeks before driving is permitted. Your orthopaedic surgeon and physical therapist will provide specific recommendations. When fully recovered, most patients can return to work, although some types of work — such as construction work, certain types of carpentry, and occupations that involve repeated or high climbing — may not be advisable for individuals with a joint replacement. Also, athletic activities that place excessive stress on the joint replacement, such as skiing, basketball, baseball, contact sports, distance running, and frequent jumping, should be avoided. It is also important for an individual with a joint replacement to keep his or her body weight as close to normal as possible. Joint wear and loosening increases with weight increase. Don’t let joint pain slow you down. If you have not experienced adequate results with medication and other conservative treatments, total joint replacement may provide the pain relief you long for – and the resulting return to your favorite activities. Write down a list of questions about your condition, your concerns, and the ways that total joint replacement might benefit you. Then make an appointment to talk to your doctor – and make note of his or her answers and recommendations. Remember, even if your doctor determines that joint replacement is a good medical option for you, it is still up to you to make the final decision.